While these colors could work with almost any theme, I saw baby boy. By now you know that for the TMCD, one should gather the necessary supplies, and be ready when you set your timer.That's what I did, paper, punch, stamps, inks, and so on... On my white Bazzill base, I cropped and attached a scrap of brown, scaled the light blue down 1/4", cut that and attached it to the brown, used a scrap of white, trimmed the bottom section off, used the scallop punch on both pieces and attached them to the blue, stamped the moon & star on the larger one, stamped another star, fussy cut it, put a pop dot on the first star and attached it to the stamped one, stamped the sentiment and whew!, done!! Simple and sweet. For my next card, I am playing along with CASology. 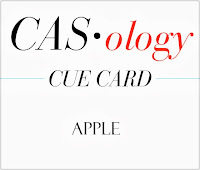 Had a tough go with this one...the cue card for this week is "Apple". And until this morning, I was totally stuck with this one. Then, whammo! !, Ping! !, I got an idea. And believe it or not, I have another one floating around in my brain. We'll see how that one pans out. In the meantime, here's the card I came up with. I know, I know...no sentiment. It's on the inside and says "feel better soon". Apropos for an apple card, me thinks. CAS. Very "S". I cut out the apple with my Cameo, and trimmed the apple to 3/4 its size. Used my mini heart punch, trimmed the hearts into seeds and added glossy accents. That's all. Now, since it's the weekend, go out and happy dance your little booties off!!!! You sure did have your craft on, Bevie! Looooove these! The simple apple card is sensational against the red card base and using the heart punch for the seeds? Genius! Well done on the 10MCD, too! Your design is fabulous for a baby boy card!! OH PING indeed! LOVE the graphic-ness of the apple - clever to set it off the edge! And I think the baby card is really sweet - love the 'cloudy' feel of the scalloped edges! Thanks for playing with us at CASology this week! I love your totally sweet first card! Great job! Thanks so much for playing along with the 10 Minute Craft Dash! And your second card is super cool! I love it! Mojo is fully engaged with these two amazing creations, Bev! Your baby boy card (and under 10 minutes *clapping of hands*) is darling; the colours do 'speak' to a wee man, indeed. Your graphic apple = brilliant! Love the off the edge, and the 'seeds' add an extra special touch! Way to go! I say skip the cleaning...it'll still 'be there' when you find time (or have the urge) to get around to it. I'm still hoping the house-cleaning elves will appear at my place before I collect my husband on Sunday! Hugs to you! I absolutely am enamored!!! I opened my phone to check on peeps, and what did this card do!??? It called to me, "Hey come on over here and get a better look!!" Really love it, no REALLY!!! Thanks for joining us this week, love seeing your cards, this one, I peeked in and then saw the artist!! " of course!!" Not surprised I love it so!!! Love the colors, and awesome placement!! I am wearing out my finger pads tap tapping on and on on my phone!!!! Have the best weekend Bev! Ps, the cleaning will not go anywhere,,,!!! PING, PING, PING indeed! First of all, trimming your hearts into seeds has got to win the "Most Resourceful Crafter Award" ... total creative genius! That baby card...yep...it rocks! Simple, sweet, perfectly balanced and layered to perfection! The apple card....well I was so blown away by your apple seed idea that I had to go back and look at the rest of the card - one word....yummy!!! You were definitely "pinging" on all cylinders today dear friend! Housework should never win, in my opinion! And good thing it didn't, your cards are just wonderful. The apple one is so fun, with the red background and the way you cut the hearts in half for the seeds ... great idea, Bev!! Housework is always there - creative time is harder to come by so run with it when the inspiration strikes! And, wow, Bev, inspiration is just ooooozing out of you. The colours of the first card do cry out for a baby boy card and you've nailed the challenge. So impressed you've done it in less than 10 minutes. And the graphic nature of the apple card is wonderful. I don't think it needs a sentiment on the front. It looks amazing just as it is! Love the soft sweet baby card! Your apple card is brilliant! Love the awesome contrast and partial use of the image! What a great card for a 10 minute dash! And it looks like you took a page from Ardyth's book for the apple - very simple and graphic. Love it! What an apple....winner winner chicken dinner!!!! Love your craft dash card too. Really sweet card! And much better than doing housework! Thanks for playing with us at the 10 Minute Craft Dash! I like the lack of a sentiment on your apple card! The apple just says it all. A perfect clean and simple card! So glad you joined us at CASology this week! I love this simple design. Having your apple over the edge is fab. Thanks so much for joining us at CASology this week! Ping, nothing. It was a ping a ling a ling. Right into the CASology Hall of Honorable Mention. Congrats! I knew I would be popping back in with a congratulations on the HM honor at CASology, Bevie!! Yep...this one was a slam dunk, guaranteed winner - had to be the oh-so-cleverly crafted apple seeds!!! Super cute. Thanks for playing along with us in the 10 Minute Craft Dash and hope to see you again. Welcome to "Happy Dance!" My name is Bev, and I'm a child of our Heavenly Father. Married to DH, we have eight grown children, and 20 (yes, you read that right) grandchildren. My life has been richly blessed, and it is my prayer that yours may be also. Why "Happy Dance?" Well there are just so many good things in life that I choose to celebrate them. What better way to celebrate even the smallest joy than to do a happy dance?! The Flower Challenge #31 a Sketch! Studio Monday with Nina-Marie: ThermoWeb Flocking Sheets! Frilled Petals in Two Ways! Jesus - The hope of the World! Happy Easter ~ Lots of Cards! My Favorite Things - April Birthday Project Challenge! Content contained herein is the sole property and responsibility of the blog owner, and is copyright protected. 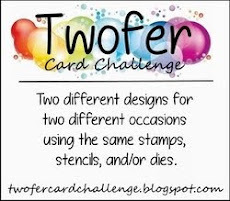 If you would like to copy one of my cards, please let me know in advance and leave a link back to this blog. Copyright 2012. Designed by Loll Thompson 2017. Simple theme. Powered by Blogger.